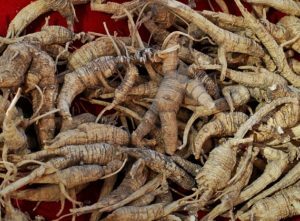 Ginseng, considered an endangered plant in many states, is allowed to be harvested in Iowa, but only under certain conditions. The Iowa Department of Natural Resources announced the following charges today in connection with alleged illegal harvest of the valuable plant. Three central Iowa men were charged with theft for allegedly harvesting ginseng roots on state managed lands along the Des Moines River valley over the Labor Day Weekend. It is illegal to harvest ginseng from all state-owned and state-managed land, and most county conservation board owned land. Bart Bollie, 53, of Madrid, Kyle Jones, 55, of Slater and Brent Jones, 28, of Slater, were each charged with fifth degree theft, unlawful possession of wild ginseng root from state-managed lands, and unlawful possession of young wild ginseng. The DNR is asking for restitution and liquidated damages equal to 150 percent of the value of the ginseng, which is $292.50 from each individual. They all had valid Iowa ginseng harvester permits. State Conservation Officer Matt Bruner was patrolling remote areas of public land in northern Dallas and southern Boone County when he made contact with the individuals as they came out of the woods in the early afternoon on Sept. 5. Officers seized 406 illegally harvested ginseng roots, including 41 roots that did not meet legal harvest age, and the digging tools. Ginseng plants must have three or more prongs and a flowering or fruiting stalk with red fruits in order to be dug up. Once dug up, the roots must have at least five stem scars to be harvested. Roots with less than five stem scars must be carefully replanted in the same location. Bollie, Jones and Jones are set to appear in Dallas County court on September 12. Ginseng is a slow-growing plant and its root is used in herbal products, supplements and teas in Asian cultures and health food stores. Most of the ginseng collected in Iowa is exported to countries in Asia, with a small portion going to cities along the west coast, like San Francisco. The price of ginseng fluctuates based on the strength of the Asian economy and lately that price has been down. Last year, average quality ginseng roots would bring $500-$600 per pound, and high quality roots up to $750 per pound. Ginseng may be harvested from September 1 to October 31 from private land with permission from the landowner, and harvesters must have a valid ginseng harvester permit. Permits are available for $37 anywhere hunting and fishing licenses are sold. There are currently 154 permitted Iowa ginseng harvesters. Iowa is one of 19 states that allow ginseng to be harvested. Ginseng is an endangered plant in some states and the U.S. Fish & Wildlife Service monitors Iowa’s compliance and enforcement of ginseng regulations to support sustainable harvest. The Iowa Department of Natural Resources is responsible for managing the ginseng harvest in accordance with the Convention on International Trade in Endangered Species of Wild Fauna and Flora.